We will see and hear the term “Darwinism” a lot during 2009, a year during which scientists, teachers, and others who delight in the accomplishments of modern biology will commemorate the 200th anniversary of Darwin’s birth and the 150th anniversary of the publication of On the Origin of Species. But what does “Darwinism” mean? And how is it used? At best, the phrase is ambiguous and misleading about science. At worst, its use echoes a creationist strategy to demonize evolution. Even a cursory search of the Internet for “Darwinism” reveals that the term is not used consistently. Historians and philosophers of science customarily use “Darwinism” to refer to the ideas advanced by Charles Darwin, especially the idea of evolution by natural selection, sometimes including related ideas such as sexual selection. This also is how Darwin’s contemporary, Alfred Russel Wallace, who independently formulated the idea of evolution by natural selection, used the term in his book Darwinism (1889). Yet Darwin’s account of evolution by natural selection involves two separable concepts, and it was not accepted as a whole. In On the Origin of Species, Darwin persuasively presented his view that living things descended with modification from common ancestors, and within a decade or so, the majority of the scientific community in Great Britain accepted the basic idea of evolution (with North American scientists not far behind). Darwin’s second proposal, that the main engine driving evolutionary change was natural selection, was not nearly as successful in convincing his contemporaries. In the 19th century, a major obstacle to the acceptance of natural selection as a general mechanism of evolution was the assumption that inheritance was a blending process. Blending would result in a reduction of variation each generation, and natural selection depends on variation constantly being available. It was not until the twentieth century, after the rediscovery of Mendel’s conception of particulate inheritance, that natural selection was recognized as a powerful mechanism of adaptation and change. The point of this historical digression is to illustrate the conceptual and historical decoupling of Darwin’s two “big ideas”—evolution (common ancestry) and the mechanism of natural selection. The former was accepted decades in advance of the latter. Today, with the insight provided by Mendelian and molecular genetics, natural selection is recognized as a primary component of evolutionary change, especially adaptation. This further complicates the meaning of the term “Darwinism.” Does it refer to evolution? Natural selection? Evolution by natural selection? Modern evolutionary biologists tend not to use “Darwinism” very often, except—again—in a historical sense to refer to Darwin’s ideas. British biologists, perhaps motivated by patriotic pride, are more likely to refer to evolutionary biology as “Darwinism” than their American colleagues, but even in Darwin’s homeland, the term now tends to be used as a pejorative (Liberman 2007). When they are speaking of the theoretical core of modern evolutionary biology, scientists tend to use the phrase “the synthetic theory of evolution” to refer to the augmentation of Darwin’s natural selection theory with Mendelian genetics in the 1930s and 1940s, followed by the development in the 1940s and 1950s of mathematical systems allowing the modeling of evolution in populations. Not in his wildest dreams could Darwin have dreamed of the scope and power of developments following the modern synthesis. Petto and Godfrey (2007) list many components of modern evolutionary biology that are decidedly “non-Darwinian” in the sense that Darwin knew nothing about them. This, of course, does not mean that they are incompatible with Darwin’s ideas, still less that they are refutations of Darwin! But components of modern evolutionary biology such as endosymbiosis, epigenetics, transposons, horizontal gene transfer, somatic hypermutation, neutralism, “evo-devo,” and the like illustrate that evolutionary biology has not been idle since Darwin shuffled off this mortal coil in 1882. So at best, “Darwinism” is an ambiguous term, having no settled meaning more definite than something to do with Darwin’s ideas. This alone would be an adequate reason for teachers and scientists to avoid using it. However, there is another reason to avoid using the term: it plays into the hands of a creationist campaign to suggest that evolution is a disreputable ideology. This is not a new campaign, but intelligent design creationism—the latest incarnation of antievolutionism—prosecutes it with unprecedented vigor. The first step in the intelligent design creationist version of this campaign has been to encourage the public’s preexisting association of “Darwinism” with a generic conception of evolution, as opposed to the historical Darwin’s insights. This is illustrated very clearly by examining a change in Of Pandas and People, the intelligent design creationist textbook that figured centrally in Kitzmiller v. Dover (Lebo 2008). Figure 1 illustrates the same page from each of the two editions (Davis and Kenyon 1989; Davis and Kenyon 1993). The word “evolutionist” in the earlier text consistently is replaced with the term “Darwinist”; “evolution” consistently is replaced by “Darwinism” and so on. This conflation of the term “Darwinism” with evolution is reflected in a project of the main intelligent design creationist organization, the Center for Science and Culture (CSC), at Seattle’s Discovery Institute. As detailed by Evans (2001), in the fall of 2001, the CSC published a full-page advertisement in three well-known national periodicals under the title “A Scientific Dissent from Darwinism.” The advertisement contained a list of about 100 scientists who affirmed a statement reading, “We are skeptical of the claims for the ability of random mutation and natural selection to account for the complexity of life. Careful examination of the evidence for Darwinian theory should be encouraged.” On its face, the statement suggested only that the signers questioned the power of natural selection, although wording appearing in the advertisement surreptitiously hinted that it was evolution itself that was being questioned by the signatories, not merely the power of natural selection. But there is more involved here than a simple choice of terminology. By insisting on talking about “Darwinism,” creationists are rhetorically transforming evolution into an ism—a position held as a matter of ideology, rather than on the strength of the evidence. By the same token, “Darwinists” is used to transform those who accept evolution into ists—devotees of isms. So, for example, CSC Senior Fellow Jonathan Witt, lamenting the decision in Kitzmiller v. Dover that the teaching of intelligent design creationism in the public schools was unconstitutional, referred to Judge John E. Jones III as a “Darwinist judge” (2005)—even though Jones acknowledged that, before the trial, he had little knowledge of or interest in evolution. Sometimes the trick is employed with almost comical regularity, as in the last chapter of CSC Senior Fellow Jonathan Wells’s Icons of Evolution (2000), where the phrase “dogmatic Darwinists” occurs almost on every page, and often more than once. It is worth adding that Darwinism is not just an ism, it is an ism that is associated with a single person. Calling evolution “evolutionism” is a specious rhetorical tactic, since it suggests that evolution is an ideology; calling evolution “Darwinism” is specious in spades, since it suggests that evolution is not only an ideology but an ideology that stands or falls with Darwin’s particular formulation of it, and with Darwin’s personal reputation. By calling evolution “Darwinism,” creationists are hoping to plant the idea that evolution is the outmoded and dismissible brainchild of a Victorian amateur, rather than the robust product of a century and a half of dogged scientific inquiry. In the same vein, Darwin is compared to Freud and Marx, all supposedly purveyors of discredited ideologies that deserve to be abandoned; a t-shirt peddled by an intelligent design creationist organization quotes Phillip Johnson, the godfather of intelligent design creationism, as saying, “Freud is dead, Marx is dead, and Darwin isn’t feeling very well” (ARN 2005). So the rhetoric of “Darwinism” dovetails with the longstanding creationist campaign of vilification of Darwin. When The Simpsons caricatured creationism with a video featuring Darwin in a hot embrace with Satan, it was only a slight exaggeration. Similarly, in creationist rhetoric, “Darwinism” is used as an epithet to link evolution to objectionable political ideologies. CSC Communications Director Rob Crowther described a group of anticreationist scientists as a “Darwinian politburo” (Crowther 2008). At a conference, Discovery Institute Senior Fellow George Gilder reportedly referred to “Darwinist storm troopers” (Cohen 2007), while intelligent design blogger Denyse O’Leary rails against “Darwinian brownshirts” (O’Leary 2007)—the brownshirts, of course, were the stormtroopers of the Nazi Sturmabteilung. On his personal blog, prominent intelligent design creationism promoter (and CSC Senior Fellow) William Dembski complains of “Darwinian fascists” (later revised, if not noticeably softened, to “Darwinian enforcers”) (Dembski 2006). The linking of evolution with ideologies such as Nazism and Stalinism is clearly intended to encourage the view that evolution is not science, but a dangerous ideology in its own right. Since the fear that evolution is a threat to religion is at the bottom of creationism, it is not surprising to find that “Darwinism” is also used to couple evolution with atheism, which creationists, practically by definition, deplore. In his book asking What is Darwinism? Princeton Theological Seminary professor Charles Hodge answered the titular question by concluding, “It is atheism” (Hodge 1874: 177). Almost 120 years later, the godfather of intelligent design creationism, Phillip Johnson, expressed much the same view, asking, “What is Darwinism?” and answering, “it is a necessary implication of a philosophical doctrine called scientific naturalism, which is based on the a priori assumption that God was always absent from the realm of nature. As such evolution in the Darwinian sense is inherently antithetical to theism…” (Johnson 1993: 189). 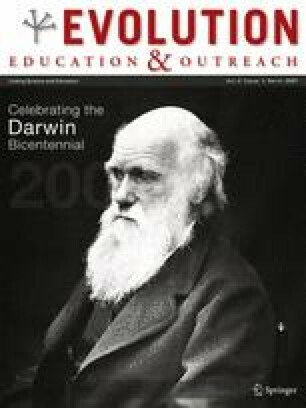 The year 2009 will be quite the Darwinfest, with universities, museums, schools, popular and scholarly journals, and other institutions interested in science holding conferences, printing special issues of magazines, and hosting special exhibitions celebrating Darwin and evolutionary biology. But along with the increase in coverage of Darwin’s life and work, readers of this journal can also expect a surge in antievolutionism, as creationists use the increased exposure to evolution as a “hook” for their own ideas. If ever there was a teachable moment for increasing the understanding of evolutionary biology, it will be 2009. Teachers and scientists ought to take the opportunity to think about how better to present the ideas of evolutionary biology, which has grown and flourished from the seeds planted by a remarkable and brilliant nineteenth-century scientist. Just don’t call it “Darwinism”! Access Research Network (ARN). Freud is dead, Marx is dead, and Darwin isn’t feeling very well. Colorado Springs, CO: Access Research Network; 2005. http://www.arn.org/blogs/index.php/3/2005/12/09/freud_is_dead_max_is_dead_and_darwin_isn. Accessed 20 November 2008. Cohen P. A split emerges as conservatives discuss Darwin. The New York Times 2007 (May 5): A1. http://www.nytimes.com/2007/05/05/us/politics/05darwin.html. Accessed 20 November 2008. Crowther R. Woodstock of science set to dethrone Darwin’s theory of evolution. Seattle, WA: Evolution News & Views; 2008. http://www.evolutionnews.org/2008/03/at_scoop_freelance_reporter_su.html. Accessed 20 November 2008. Dembski WA. Troll of the month award. np: Uncommon Descent; 2006. http://www.uncommondescent.com/evolution/troll-of-the-month-award/. Accessed 20 November 2008. Evans S. Doubting Darwin through creative license. Reports of the National Center for Science Education 2001;21(5–6):22–23. http://ncseweb.org/creationism/general/doubting-darwinism-creative-license. Accessed 20 November 2008. Judson O. Let’s get rid of Darwinism. New York: The New York Times; 2008. http://judson.blogs.nytimes.com/2008/07/15/lets-get-rid-of-darwinism/. Accessed 20 November 2008. Liberman M. Bad Darwinism. Philadelphia: Language Log; 2007. http://itre.cis.upenn.edu/~myl/languagelog/archives/005007.html. Accessed 20 November 2008. O’Leary D. Intelligent design and popular culture: Darwin activism hits Toronto. np: Uncommon Descent, 2007. http://www.uncommondescent.com/intelligent-design/intelligent-design-and-popular-culture-darwin-activism-hits-toronto/. Accessed 20 November 2008. Westneat D. Evolving opinion of one man. Seattle Times 2005 (August 24): B1. http://seattletimes.nwsource.com/html/localnews/2002450329_danny24.html. Accessed 20 November 2008. Witt J. Dover’s Darwinist judge rules against competing theory of intelligent design. Seattle: Evolution News & Views; 2005. http://www.evolutionnews.org/2005/12/dovers_darwinist_judge_rules_a.html. Accessed 20 November 2008.